After defeating Lord Business (Will Ferrell) and stopping Taco Tuesday, Emmet (Chris Pratt) and his friends think everything is awesome. That is when the invaders from Planet DUPLO arrive. The creatures from Planet DUPLO destroy everything in their path. Five years later, Bricksburg is a Mad Max-like wasteland, now called Apocalypseburg. The residents are constantly in fear of the DUPLOs returning. All the residents, that is, except Emmet, who is as optimistic as ever. An alien ship arrives one day bringing General Mayhem (Stephanie Beatriz). Mayhem captures Lucy (Elizabeth Banks), Batman (Will Arnett), Unikitty (Alison Brie), Benny (Charlie Day), and MetalBeard (Nick Offerman) and takes them to the Systar System. Queen Watevra Wa’Nabi (Tiffany Haddish), leader of the Systar System, has brainwashed all its inhabitants to believe everything is, well, awesome. She announces her intent to marry Batman, uniting their worlds under her rule. With the help of the mysterious stranger Rex Dangervest, Emmet makes the perilous journey from his home planet to the Systar System to rescue his friends and stop his dream of Ar-mom-ageddon from coming true. The Lego Movie 2: The Second Part is set conveniently five years after the original The Lego Movie, which was released exactly five years ago. All of your favorite characters from the first movie are back along with some new faces. The cast is full of huge stars, almost too many to list. Each characters is voiced by someone who matches their animated personality. While the situation in Bricksburg/Apocalypseburg is dire and most of the residents are more mature and hardened, that doesn’t mean the sarcasm and humor is gone. The jokes still fly fast and free, keeping things light and funny enough that this sequel lives up to the bar set by both The LEGO Movie and The LEGO Batman Movie. Having found a formula that was incredibly successful, writers Phil Lord and Christopher Miller take that formula and punch it up a bit. Since the secret behind the LEGO universe has been revealed at the end of the first film, in the sequel we get more glimpses into the real world, giving some context to exactly what is going on behind the events in the LEGO universe. It was necessary to help explain what is happening and the motivations behind Emmet and his friends’ actions. This also sets up a Matrix like situation, which is directly referenced at one point in the film. Speaking of this, the film is much more self-aware and self-referential than the first. At times, it gets a little too heavy on these references to the point that the song from this movie that will definitely get stuck in your head is titled “Catchy Song” whose hook is literally “This song is gonna get stuck inside your head.” (Just typing this has the song stuck in my head again.) It’s a bit gimmicky, but somehow it works. 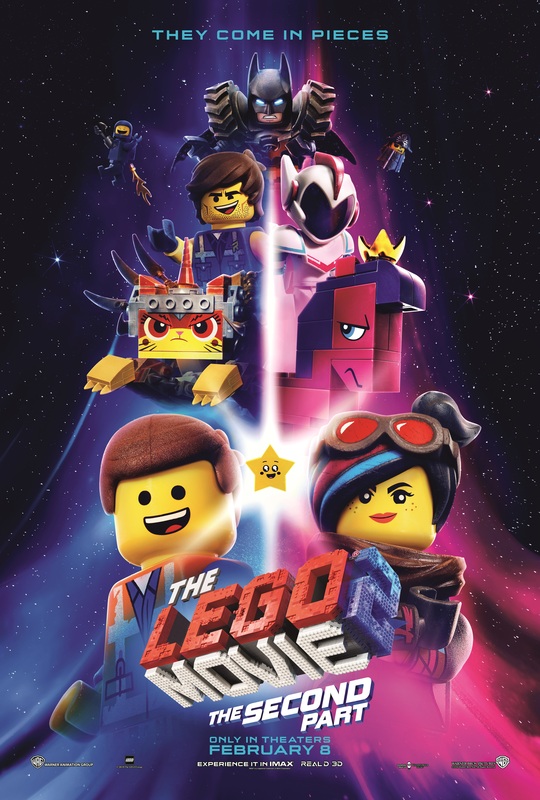 If you liked The LEGO Movie, or LEGO Batman, I have no doubt you will like The LEGO Movie 2. It’s a colorful, action-packed movie that is funny and well-thought out enough to keep both young and old entertained. It is a great choice for a movie night with the whole family.